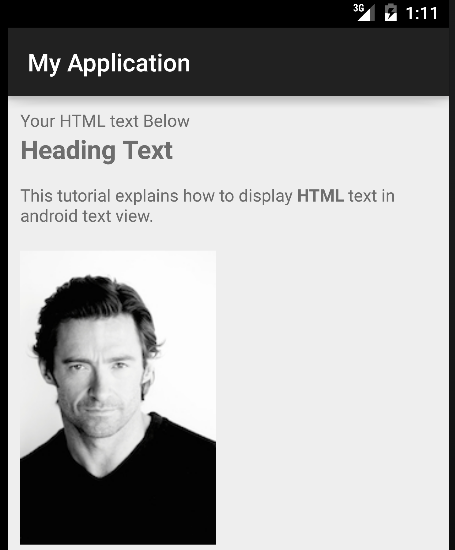 In this tutorial, we will take a look into displaying HTML text in Android TextView. Many times while you design an application, you may encounter a place where you will like to use HTML content in your screen. This may be to display a static “eula” or “help” content. In android there is a lovely class android.text.HTML that processes HTML strings into displayable styled text. Currently android doesn’t support all HTML tags. Android API documentation does not stipulate what HTML tags are supported. Currently android seems support the following HTML tags to be rendered on TextView. From HTML method returns displayable styled text from the provided HTML string. As per android’s official Documentations any tags in the HTML will display as a generic replacement image which your program can then go through and replace with real images. Html.formHtml method takes an Html.TagHandler and an Html.ImageGetter as arguments as well as the text to parse. We can parse null as for the Html.TagHandler but you’d need to implement your own Html.ImageGetter as there isn’t a default implementation. The Html.ImageGetter needs to run synchronously and if you’re downloading images from the web you’ll probably want to do that asynchronously. But in my example I am using the images from resources to make my ImageGetter implementation simpler. Create a new file inside layout folder and name it as main_layout.xml and paste the following code. Here is our Activity code, where we will render HTML tags in TextView. Thanks a big lot, mate! Is it possible to modify the styling of existing tags, as we do in browser by css? Your ImageGetter should handle that. Not quite sure if the latest webkit supports. You need to give a try. But as far as I know, it doesn’t support. I get an error for the line ” id = R.drawable.hughjackman;” stating hughjackman cannot be resolved to a type. How do I fix this? Do you have an image named “hughjackman” in your “Drawable” folder? If not, that’s where that issue comes from. Change “R.drawable.hughjackman” to a different image. Not works, I tried this solution. For that you may requireHTML spanner library. getResources is a function of context class. So Activity, ActionbarActivity, FragmentActivity would have it. are u calling it from activity or a fragment or an other class? Option-1, Use web view to display your website as is on your device. Option-2, Your website should have the RSS or JSON feed in order to make it accessible from mobile app. In such case you can build pure native application. can i get the HTML text from a separated file intead using a atributte and set it to a HTML file? you have to put your layout inside scroll view. can we set asynktask in getDrwable function? @Simon, There is no official documentation available on the HTML tags support for android using Html.fromHtml. @simon, I agree with you. I have depicted the same in my post. The support of HTML tags are limited to few tags as of now. However it is nice to have feature in android, though developers can’t rely on it. WebView is a replacement to browser, it is obvious to support all tags. However, when it comes to TextView rendering HTML tags, it is limited.